David, in his pleading with God, puts it plainly. He understood where the problem lay…in sin. To say that God made you sick to teach you something, or He made you poor to keep you humble, is to go against everything the Word teaches. If this was true, then why try to get delivered…it is difficult to get delivered from anything we suppose God is the source of. In fact, it is wrong to expect God to take something away that He gave you! Please understand this; God is not the one who blesses and curses…God is good! Some may even say: ‘I was born this way.’ That may well be true but that is not to say that God wanted you that way—whatever that way is. Sin is in this world and is the reason for every ungodly manifestation we experience in this life. However, we need the power of God to break free of it all and we can because God is good! Remember, “Every good gift and every perfect gift is from above…”; God gave us His Son to bring us into right standing with Him, His Word to transform us into His image, and His Spirit to keep us and guide us into His Truth. With all this, how could He also be the source of every ill and discomfort we face? 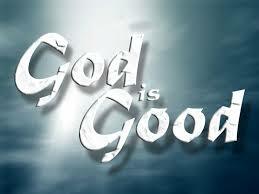 The answer is: He is not, because God is good! 30 As He said these things, many believed in Him [trusted, relied on, and adhered to Him]. 31 So Jesus said to those Jews who had believed in Him, If you abide in My word [hold fast to My teachings and live in accordance with them], you are truly My disciples. 32 And you will know the Truth, and the Truth will set you free. I have to be the first: God is good…All the time! Thank you so very much for stopping by and responding. May God’s Blessing be upon you! You’re welcome! I still haven’t forgotten you two! Expect breakthrough at any time!! Thank you and Blessings to you as well! Good post. I agree with what Nopew stated as well. Sometimes too when we ask God to renew us and show us ourselves we might not like the answer, but it is for our good. I agree. I also note that Hebrews 12:5-11 teaches that God disciplines us. Now that results from our sin, of course, but it also means that sometimes God acts to “purify” our soul. While God does it “for our good”, it also says “we don’t enjoy” it. So God wants the best for us, and that sometimes means straightening us out, with a hug or a poke or whatever. Because God cares. And when we declare “God is good” it means we take both the good and the correction humbly. That’s progress! Thank you for your comment that adds to this post. As far as the passage you referenced…I believe it has more depth than we can see at first reading. God’s goodness is truly past our ability to discover in the natural. No reflection on you…just an observation that needed to be stated for all that my read this! Love you my brother and God bless! Naturally (sorry, couldn’t resist the pun) the Bible speaks deeply into our souls (Hebrews 4:12). Though we see Christ as through a foggy mirror, we catch glimpses, and that causes me to rejoice. And blessings for you, too, brother in Christ. Thank you! That’s a good one! Believe me, I appreciate you and your input so much! Very good post and much needed. The simple truth of the Word, boldly said! I praise God for those brethren like yourself who continue in the Truth of the Word, without watering it down. Thank you Stephanie for the encouragement…I so appreciate it! Blessings to you and yours! Sebastian, this message is so very important. Thanks for sharing it. When my mom was first diagnosed with terminal brain cancer last October, someone told me if I had enough faith she’d be healed. It felt like an enormous burden, and since I was vulnerable to the words of others, I struggled immensely. I don’t remember the exact words you wrote to me, but I remember the impact you made on my heart. You helped demolish the burden and helped me see that my faith had nothing to do with whether God would heal my mom or not. God has brought forth so much goodness since her diagnosis. Romans 8:28 is the prophetic verse my mom spoke over our family. We cling to God’s goodness as we grieve over losing her in January. Thank you for sharing the wisdom and insight God gives to you. It makes a difference. You’re welcome Sheila! Keep checking in…Blessings! Dear Sebastian! what a wonderful word! So many are blinded to the truth and we need to continue getting the word out that is the truth. God bless you! Thank you so much for the encoragement and comment. Yes, it is important to take a Godly stand on the authority of God’s Word. Blessings to you as well! thank you for sending these to me. not sure if i ever told you 🙂 Keep us in your prayers please? Hope y’all are doing well, miss you guys!